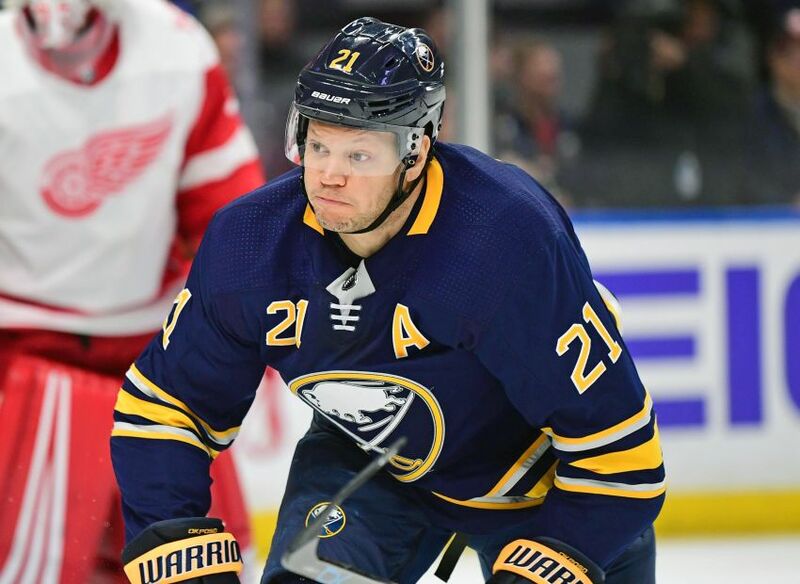 TORONTO – Kyle Okposo nearly ended his hockey career as a rambunctious child when he knocked over his family’s Christmas tree. Years later, the Buffalo Sabres winger briefly gave up the sport, choosing instead to focus on basketball and football. Tonight’s tilt against the Maple Leafs at the Air Canada Centre will be Okposo’s 667th NHL game. In his 10-year, career, he has been an NHL All-Star and scored 171 goals and 456 points. Two summers ago, the Sabres awarded him a seven-year, $42 million contract. Hockey has treated Okposo very well. Two weeks shy of his 30th birthday, in the midst of a miserable season, his passion for the sport is still evident. But Okposo has thrived at the highest level of hockey, in part, because he enjoyed other sports growing up in Minnesota. While hockey was important to him as a child in St. Paul, he excelled in basketball and football. Okposo refused to burn out on one sport. First, the Christmas tree story. It was the early 1990s, and Kome and Michele Okposo had signed their son up for his first year of organized hockey in Minnesota. But the idea of Okposo playing hockey hardly appealed to them. His father grew up in Nigeria and came to the United States for college. He knew little about the game. His mother had lived her entire life in Minnesota. No one in her family, however, played hockey. Still, they let him play, at least until the Christmas tree came crashing down. “I knocked over the Christmas tree with a toy and a hockey stick, so they made me quit there,” Okposo said. That’s right, his parents yanked him out of hockey as punishment. “I don’t think they wanted me to play,” Okposo said. Okposo quickly found other ways to play and kept developing his passion for hockey. “That year I went to the outdoor rinks, just skated around and played, and I … fell in love with it really early,” he said. His parents would eventually let him play for a team again. “After they tried to push me away from hockey, they realized I loved it so much, they just kind of said, ‘Do what you want,’” Okposo said. Ask Okposo about basketball, and he starts smiling. Okposo said as long he worked hard and finished his schoolwork, his parents were fine with his athletic pursuits. Still, he hardly liked school. In basketball, Okposo played small and power forward. In football, he played running back and defensive end. “Loved rushing the quarterback,” he said. Meanwhile, Okposo kept developing into a notable hockey talent. During the summer, he would practice three hours a day four times a week on a team featuring future NHLers Erik Johnson, Jamie McBain and Peter Mueller. But in eighth grade, he stopped playing organized hockey. His school wouldn’t let him try out for the high school team. Rather than joining the middle school squad, he spent the year playing basketball and football. To Okposo, giving up hockey – he still skated once a week before school – wasn’t risky. The summer before beginning ninth grade, Okposo planned to follow his sister, Kendra, and attend Cretin-Durham, his local high school. “Football was going to be my No. 1 sport and I would play hockey, too, but I was probably a better football player in eighth grade,” he said. But Shattuck-St. Mary’s, a school whose record of producing NHL talent is unparalleled, was recruiting Okposo. The hockey culture and community impressed him during his visits, so in late August, he decided to leave home for Shattuck. Hockey would be Okposo’s sporting focus. Okposo’s freshman year, he scheduled his classes so he could watch Shattuck’s biggest star and the world’s most talented teenager, future Pittsburgh Penguins center Sidney Crosby, practice with the prep team. In 2006, the New York Islanders drafted Okposo seventh overall. He played a season and a half at the University of Minnesota before turning pro. Okposo, who scored two goals in Saturday’s 7-4 win in Nashville, made the right choice picking hockey. Basketball still calls him, though. Nice story, nice fella, but he must be traded or retire. He is unhealthy and slowing down in a young man’s fast league.